Dave Hudson bettered his second place in the Eye 5k when winning Sunday’s Abbey 10k at Ramsey by a huge margin. On a scorching Sunday morning the BRJ member blazed his way to a finishing time of 32:52. Shaun Walton also improved on his placing at Eye by coming second in a new PB of 34:37 , but had well over a quarter of a mile to run when Hudson crossed the line. Mark Barry from Huntingdon AC took third place a further 30 seconds back. 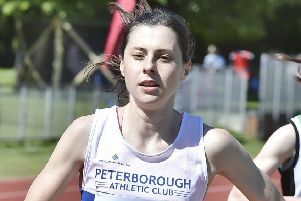 Peterborough AC’s Phil Marin finished fifth on what proved to be a good day for the city club. Chloe Finlay followed her win at Eye with another at Ramsey, completing the dust-bowl of a course in 38:22. March AC veteran Toni Alcarez was second in 40:24 while Sarah Wightman of Cambridge and Coleridge was third with a time of 40:54. PAC’s Hannah Chapman was the next finisher with a 41:14 clocking, and Samantha Cullen of Eye was just a couple of steps behind. Sebastian Darnell of Huntingdon AC won the 2.1km junior race, but Nene Valley youngsters were also to the fore with Dylan Tomaselli third and William West-Robinson fifth. Caitlin Burke of Huntingdon AC won the girls race ahead of Nene Valley’s Olivia Mead.